This is the website for Nationwide Ministry. We can be reached via email at Postmaster@NationwideMinistry.Com or by phone at 773-315-5999. 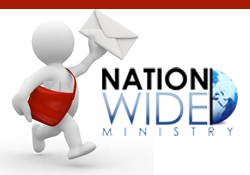 If you do not want to receive anymore email from us please reply to any correspondence you’ve received with said request or email us at Postmaster@NationwideMinistry.Com and we will remove your name within ten (10) business days. The information we collect is used for the following: the promotion of ministry or ministry focused efforts and events. Persons who supply us with their phone number can expect that on an infrequent basis your number may be utilized in an automatic phone blast, to communicate with you information about an event which we feel you may have interest in. You may also be contacted with information regarding services, products or events which we Nationwide Ministry deem relevant to your demographic. If you supply us with you home address you can expect to receive on an infrequent basis mailings sent out by Nationwide Ministry on behalf of ministries and ministry related entities with information which we feel you may be interested in. If you supply us with your churches information it will be used to update our databases to help in futuristic mailings about up and coming local or national events, which your ministry may have interest in. We do not partner with, nor do we share your information with others, we act solely as the agent of communication. We never sell our database information to third parties. From time to time we may utilize your information, for unanticipated uses not described in this policy. If our policy changes we will post them and allow you the opportunity to opt out as you wish, you are never a captive. Upon request we do make available contact information or other information that we have collected about ‘yourself’ the subscriber to ‘you’, so as to be able to correct any inaccuracies located within our database. You may make these requests and changes by calling, writing, or emailing us at the addresses given. We utilize the latest forms of spy ware, virus, and Trojan protection, with the exception of requested ‘re-sends’ we never send attachments, and all emails sent will in their subject line contain a true description of the information included. Any links found within this site are strictly for assistance in acquiring information for you. We are not responsible for any information, content, or links provided on these sites. We reserve the right to remove any links within our site, at any time, without use of notification. If you decide to link to any third parties, you do this completely at your own risk.